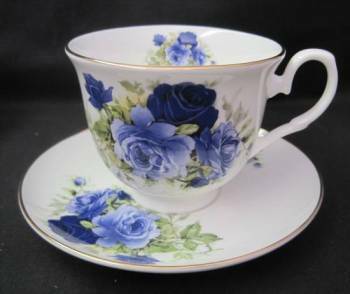 Lovely pale blue and deep blue roses blossom on this pair of bone china cups and saucers in York style by Adderley Ceramics. These cups and saucers are trimmed in gold and are not microwave oven safe. Blue roses symbolize attaining the impossible. What a great gift for someone who has accomplished a great achievement.